For the last Six Years I have studied Tarot intensely and in that time I have produced 3 Series of Essays on the Subject. There are plenty of good books, (including Janina's mentioned below), that discuss the traditional meaning of the Tarot cards so most of my essays have not had that focus. Instead, I have been reflecting on the themes of the Tarot as they have played out in my life. I am over 40, and have been blessed, by not living a sheltered life. That experiance has gifted me with something to say about most of the issues the cards reflect in my life, and yours I hope. Talking Tarot: As I grew as a reader I noticed a distinct lack of Tarot Literature that I would want to read myself. Lots of books and essays on the meanings of individual cards, but very very little, on the meaning of cards in the context of a reading. My Talking Tarot Series was concieved as an Online Book of 22 Readings that would adress this gap; the series is nearly complete and I hope to finish it by labor day. I think this may be the most "important" thing I have written because I feel this gap is very wide; learning the meaning of individual cards outside the context of a reading is like learning the moves of the chess pieces outside the context of a actual game; a necessary baby step; but one that can only carry you a very short ways. It is my sincere hope that this online book will spark others better qualified to pick up on this idea and gift us with the stories of their readings. Card of the Week: All things Tarot Edition, The First series of Essays was a Card of the Week collection for All Things Tarot; This series of essays comes from a time when I was just coming out of a long spiritual and creative dryspell. The 90's were a most challanging decade for me, and those challanges put there stamp on my reading of the cards in that moment, through to today. Looking back on these essays there are some that still speak to me, and some I would change a great deal; but perhaps your present moment has more in common with my moment at the time; and you might find something of value here. Card of the Week: GTS Edition, Well times change and we grow, and our vision of things, like the Tarot evolves with us. 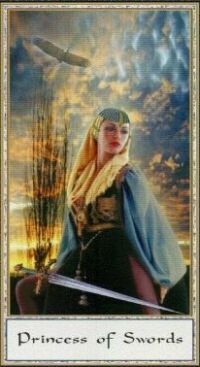 I returned to the Card of the Week Idea this time for my current group Goddess Tarots. I have only really begun this series of Essays, but thats fine. I expect when I have completed it, I will start a 3rd Edition, because you see ones relationship with the Tarot is always growing. Still these Essays represent a more matured relationship with the Tarot; and myself; and I do hope they speak to you as well. Reading for others is central to my Spritual Life; it is how I connect to my guide, and perform my Spiritual Work in this world. My approach to reading is that of a Story Teller; A Querant requests a reading, and I pull a spread of cards appropriate to their issue, and relay to them the story the cards tell me in the context of thier Question. Over the years I have had very good; sometimes amazing results. Much more rarely I have simply been wrong. I make no claims to being Psychic, that is another level of Gift beyond mine; but it has been my Privledge to help many people find their way in an important moment of thier lives and that is no small thing. I have read for Good Friends, and Total Strangers, Readers and Non-Readers, Online and in Person, all with good results. I have done over 500 readings now, and I can state simply and truly I have become an accomplished practioner of this art. I still read for free for members of Goddess Tarots and Sprituality. and sometimes, Witch Essentials, and will soon be expanding my practice to include professional readings as well. If you are interested in a Reading email me at Blackbird_61@yahoo.com. Your Name; Either your given name, Your Online Handle or a Nickname you Identify with strongly. Your Age. It affects the proper reading of the court cards. Either for a General Reading. or a Reading on a Specific Issue; in an The Issue is __________________. Format. If you wish for me to read about a specific issue; Please keep your request as short as possible; the less I "Know" the what I know can bias the reading. You might be looking at Two Job Oppertunities, or Whether to continue in your current position or accept a new one. Both of These are appropriate to a Cross Roads Spread; Or you might be Quite comfortable in your grasp on your present moment, but wondering how to achieve a given goal from here; which is appropriate to a Manifestation Spread; and of course we all seek for guidance or at least reassurance in our relationships, for which I rely on the Cuppa Spread. The Cuppa is a beautifal spread that elegantly Lays out the Querants Energy, Her(or His) Partners, and where those energies Entwine. If you wish for me to pull a Relationship spread I will need your partners name as well. Please do understand Tarot is not my primarly way of making my living; so I will reply to your request promptly, and pull your cards the first available day my work allows. I do not try to Squeeze readings into work days, I like to take as much as a Half Hour to Meditate and Clear my mind properly before reading. I do not simply shuffle up and deal; I believe this gives you a much better reading and you deserve my very best effort in return for putting your trust in me. I guess thats all for this section; please consider me the next time you need a reading. :) BB. I Founded Goddess Tarots and Sprituality. A group dedicated to exploring the Goddess centered Tarots, such as the Gendron, Tarot of the Old Path, and of Course the Goddess Tarot itself. We are not a specifically Wiccan Group and we welcome anyone who is interested in exploring the divine feminine. Our message board is open so you may review our archieve and see if this is a place you would like to sit back and chat some. I hope you will consider joining us. I would also recommend to your attention the Witch Essentials group, Gaia provides a great place to go if you need a help or advise from someone versed in The Craft. Spiritually I really dont quite fit in any tradition. I am a Pagan and the Wiccan tradition comes closest to describing where I'm at spiritually. I also think there is much of value to be found in Carlos Castaneda's books, and Buddhism. An Open Letter on the Subject of Wicca. On Dec 8th 2003 George Noory interviewed Fiona Horne on Coast to Coast AM, on the subject of Wicca. I found I was not happy with the interview overall so I got it into my head to copy down George's questions and anwser them to the best of my ablility myself. I have linked a copy of my letter to George here. If you are wondering what this emerging religion is about, perhaps I can anwser some of your questions. I dont actually own very many Tarot Books. I've always read very slowly, and my work is very demanding of my time. So the few books I refer to I highly recommend, as both useful, and written in a voice that is enjoyable to read. If you would allow me to share a few thoughts with you about each book, click here. I'm ultimately a very visual reader. I "studied" for years with the JJSwiss and Magical Tarots, and quite honestly never got anywhere. For me a picture truely is worth a thousand words, and I have gravitated towards more modern pictorial decks. In the last couple of years I have learned more than I ever could have hoped. I can now read from decks like the Marseilles, because deck or no, I can almost always picture the card I need in my minds eye. The decks pictured below, make up most of my collection. I share a few thoughts on their strengths and weeknesses on the linked page. Tarot is certainly my most active interest right now, I have been discovering new resources lately. Especially in terms of Astrology, and the Echoes of the Sun Signs in the Trumps and Court Cards. This section of the site is sure to grow, so if you like what you see so far, come back for more soon.